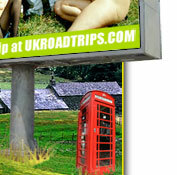 Uk Road Trips 2 British sluts fucked hard in every hole! Back to London where �randy� Sandy and her girlfriend DJ were waiting for us in their hotel room. Well... waiting... we think they spent most of their time warming each other up, getting ready for a load of fresh dicks to arrive! British sluts give head in public places!